CCleaner is a freeware system optimization, privacy and cleaning tool which removes unused files from your system – allowing your Windows to run faster and freeing up the hard disk space. It also cleans traces of your online activities such as your Internet history, which cleans Temporary files, history, cookies, Auto complete form history and more from Internet Explorer, Firefox, Google Chrome, Opera, Safari. 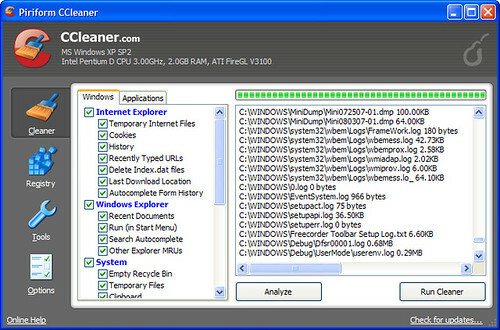 Among all other good features CCleaner is highly secured and is available in the following 35 different languages: English, Albanian, Arabic, Bosnian, Bulgarian, Catalan, Chinese (Simplified), Chinese (Traditional), Czech/Slovak, Danish, Dutch, Finnish, French, Galician, German, Greek, Hebrew, Hungarian, Italian, Japanese, Korean, Lithuanian, Macedonian, Norwegian, Polish, Portuguese, Portuguese (Brazilian), Romanian, Russian, Serbian Cyrillic, Serbian Latin, Slovak, Spanish, Swedish and Turkish. CCleaner was downloaded over 260 million times till date – Must give it a try…..
CCleaner also has a fully featured registry cleaner which removes unused and old entries.